Looking for a Bedlington Terrier? The Bedlington Terrier was developed in the village of Bedlington, Northumberland, England. Known as gypsy dogs, Bedlingtons are agile dogs valued as racing and rabbit coursing dogs. They may have a comical and enthusiastic personality but they can detect suspicious actions, making them good watch dogs. Their lamb-like coat does not require stripping but should be clipped to maintain that crisp look. With a moderate energy level, they can match their owner’s energy and pace without complaint. Are you thinking of getting a Bedlington Terrier? Here is a brief background of this enthusiastic lamb-like dog. The Bedlington Terrier was developed in the village of Bedlington, Northumberland, England. They used to be known as gypsy dogs because they helped gypsies and poachers hunt rats and badgers. When it caught the attention of the Lord of Rothbury, it was named Rodbury Terrier, Rothbury Terrier and Rothbury’s Lamb. The first one to be called Bedlington Terrier was Joseph Ainsley’s dog named Ainsley’s Piper in 1825. Bedlingtons were valued as racing and rabbit coursing dogs. To increase their speed and agility, it is believed that they were crossed with the Whippet. Having similarities with the Kerry Blue Terrier, Dandie Dinmont Terrier and Soft Coated Wheaten Terrier, some speculate that they may share the same ancestry. The breed officially joined the ring show during the 1800s. The National Bedlington Terrier Club, on the other hand, was formed in England in 1877. With lamb-like features, the Bedlington is a graceful and agile dog. It stands 38 to 40 centimetres tall at the withers and weighs 18 to 23 pounds. It has a rounded head with no stop, almond-shaped eyes and close-fitting lips. The breed has a distinctive coat, which is a unique combination of soft and harsh hair. It feels crisp but is actually not wiry. It tends to curl specifically in the head and face. According to The Kennel Club standards, the acceptable colours are blue, liver, or sandy with or without tan. Blue Bedlingtons must have black noses, while liver and sandy must have brown noses. Like most terrier breeds, it does not require stripping. It is a mild shedder and needs weekly combing. It should be clipped to maintain crisp look, which can be done at home or at a professional groomer’s. It is also important to ensure that a Bedlington’s ears are clean, nails are clipped and skin is checked for abnormalities and fleas. Ignoring these aspects of basic grooming can often lead to infections and diseases. Bedlingtons are enthusiastic and comical dogs that love attention especially from family members. It welcomes and entertains guests but can sense suspicious intentions because it is actually a good watchdog. It is playful towards children but can be rough so supervision is needed for very young kids to avoid injuries. It can get along with dogs it has been raised with. However, it can be aggressive when provoked especially by dogs of the same gender. This breed is intelligent and is moderately easy to train especially if it knows the benefits it will receive. Make use of plenty of positive reinforcements because harsh words and physical force would not work. Training should involve praises, playtime and treats. They would enjoy agility workouts where they can display their grace and speed. Before getting a dog, make sure to do your research to have an idea of the temperament and personality it is predisposed to have as a breed. However, each dog is unique and training, socialisation, and environment can influence the overall characteristics of your dog. A typical serving for an adult Bedlington is 1 to 1.5 cups of excellent quality dry dog food per day. Take into consideration that in feeding, the amount of food depends on its age, size, build, activity level, and metabolism. Work closely with your veterinarian to provide the best nutrition for your dog. Bedlington enthusiasts claim that this breed has sensitive digestive systems. This is the reason why homemade food is recommended or special dog food formulated for sensitive stomachs with fewer ingredients. It is better to go grain-free or avoid corn, soy and wheat that tend to upset their stomachs. They thrive on fish and other easy-to-digest meat such as chicken and turkey breast. Fibre can be in the form of oats, sweet potatoes, flax seeds, and other fruits and vegetables. The average lifespan of this lamb-like dog is 14 to 16 years. It is generally healthy but predisposed to certain medical conditions. Aside from having sensitive stomachs, it develops Copper Toxicosis, Distichiasis, Retinal Dysplasia, Patellar Luxation, and Renal Cortical Hypoplasia. Bedlingtons have moderate energy levels and activity needs. However, it will match its owner’s activity level. It will do fine with slow-paced walks and jogs or vigorous rounds of games. After such activities, it will be contented to lounge around the house the whole day. Dog ownership is a huge responsibility since this type of pet has complex needs. Apart from establishing routines and setting rules, owners need to think about the financial aspect as well. The cost of buying a well-bred Bedlington Terrier can be around £300 to £500. Basic pet insurance costs around £300 annually while a lifetime policy can be around £540 a year. You also have to factor in high-quality food, basic pet equipment, regular vet check-ups and necessary preventive care treatments, which will cost £90 a month or a little over £1,000 a year. These steep numbers don’t even include unexpected veterinary treatments and procedures not covered by your policy. 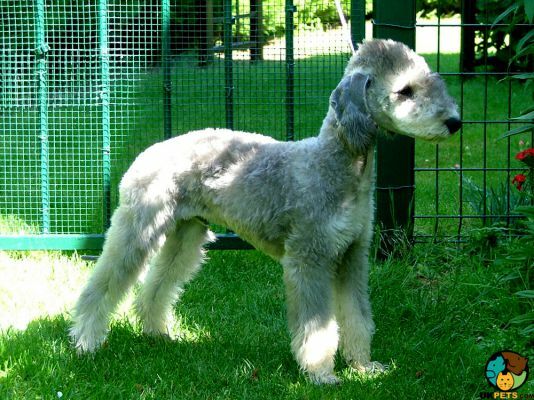 Is a Bedlington Terrier Right for You? The Bedlington Terrier is a lamb-like dog that is agile and graceful. It is comical, intelligent and protective of its owners. It has a moderate energy level that can easily adjust to its owner’s activity level. Its coat, a combination of soft and harsh hair, needs to be clipped to maintain its crisp look. The breed is intelligent yet often refuses to cooperate during trainings if it does not get any rewards. There are many arguments regarding the accuracy of hypoallergenic dog breeds claims. Can you be allergic to some dogs and not others? People who have allergic reactions to dogs are not allergic to dog hair. Instead, they suffer an allergy from the dog’s dander.